Thanks! I clicked on the link instantly. Great price... but the GV Wide Trail 12x42 is not available online from SAIL, the linked seller. I'm in Abbotsford, BC, (SW corner of the country) and the SAIL brand apparently only has stores in the East. I will phone them tomorrow and see if they will sell me a pair and ship. The GV Wide Trail 12x42 is also sold out or not available on several other online retail sites I have checked today. I phoned GV headquarters to ask what is up and a helpful man told me that it is out of stock this time of year for many retailers and they don't want to restock till closer to next winter. He also told me that they almost never put that model on sale, maybe once every four years. He said that most discount sales are due to cosmetics, and that the GV Wide Trail never changes. Outdoor workers are a major market for the basic big GV Wide Trail. I'd sure like to try some, I was having some climbing troubles last time I took mine out. I'd really like to get some 60" ojibwas next, but I wish there was an easier way to calculate surface area across different shapes. I hate snowshoes with tails. I have several pairs of them, natural and plastic, that I would gladly sell. It seems that whoever wears them gets tangled up and falls. The tail is a real nuisance. I prefer elongnated bearpaws or bearpaws. I also have a pair of mountain masters that work well but they are noisy. Faber is a snowshoe company worth checking out. Good gear and prices. I was in Princess Auto (in Coquitlam) the other day and noticed that they have the surplus magnesium snowshoes on sale for $ 50. It certainly wasn't scientific, but very similar. My buddy was with my on the same snow with 125s, and I think I would have needed a ruler to quantify the differences in floatation, I wouldn't worry about it. I'd say most people are better off with 125s in general. FWIW update on finding GV Wide Trail 12x42 snowshoes on sale: Three retailers offer them online at lower cost than the factory site, one of them a very good sale price... BUT none of the three has any to sell. One outfit back east will not sell them online, only in their store, and the others are all out of stock, etc. Bummer. GV headquarters has them for their full retail price but at this point in the winter season I think I will wait until closer to next winter rather than pay full price and have them sit for months. Wish I had them today because I'm heading out to the snow for the rest of the day. I have learned a ton from you all. Thank you. I very much like and prefer the tails when I'm going somewhere, mostly straight-line. The tails are like a rudder. And for straight-line travel it is CRITICAL for me that the snowshoes "nest" as you step, so you don't have to keep your legs far apart. But for camp-work, or setting traps and that sort of thing, where you're turning around a lot, I wear the bear-paws (which are in the photo). I have never seen the GV's go on sale, and they are certainly pricey. Too bad you didn't have access to a bunch of different ones to try before you pull the trigger. 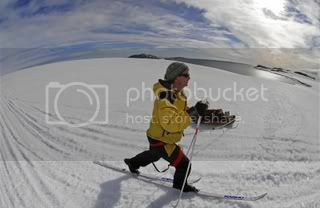 For instance I'm not a fan of really wide snowshoes, they don't work well with my short legs, lol. Thanks re sale on GV Wide Trail. I suspected that. Yes, wish I could try several. It is late already this snow season in my area, and I'm still pondering. I think the 12x60 monofil laced traditionals would be good for travel on unbroken trails and unplowed logging roads but for my use maneuvering in timber and brush, shorter seems wiser. I often travel from a logging road into timber and there is always a border of deadfalls in the edge of the trees, before you get into open forest. That transition zone has been the worst for me, falling through, bridging snowshoes across logs, poking a shoe into the snow void under a log, etc. I have done the falling through and falling down and crawling over snow covered logs and am ready to try struggling with less wieldy wide and long shoes that keep me on top more. Once inside the forest travel is usually much easier, though the undisturbed snow is often soft and calls for a big shoe. Have you pulled any triggers yet?? No, haven't pulled the trigger on buying snowshoes yet. I have been travelling to family commitments etc. and kind of set aside the snowshoe quest for now, and unless I run across a great buy, will probably wait till next Fall. Loved your video! That mess of logs and brush in deep snow is exactly the scenario. Beautiful country. Great floatation on those big snowshoes. I sure wish I could try the GV Wide Trail 12x42 and the LoTN Huron 16x48. I have liked the claws on modern synthetic snowshoes and found them helpful on icy patches and sometimes in grabbing brush tops or a log when going up a steep spot, so if I buy without trying, have decided to make it the GV Wide Trail 12x42 even though I wish they were longer. Their strength when bridging logs is another factor in my choice. I have them on my 16 x 48 Hurons and I like them. The claw is removable with a couple of bolts and I took mine off years ago because they are just more trouble than they are worth most of the time. In icy, settled or crusty conditions I use a smaller modern shoe. I started snowshoeing about 1970. I have had and used most styles, except Cree, and many sizes from 30's to 60's... wood and metal, with and without crampons. I prefer modern metal with crampons and the new BOA system is pretty awesome. Many of the modern crampons don't ice up much or hold it because their shape. I'll get more ice under the foot then in the crampon. I'm big and heavy and always carry a minimum of 20lbs in my pack...so figure with clothes and boots my snowshoes are carrying a minimum of 275lbs. I've never broken a wood or a metal shoe but have busted modern and old webbing. I'm careful when going over logs or rocks but will push to the max going up or down steep terrain, usually needing a long handled ice axe, and do far more bushwacking than trail work. I'd love to try the 12x42s. I normally wear 36'ers. In powder over 3 feet the big long wood Fabers are great. In steep mountain terrain, especially on icy trails, one needs crampons front and rear. Wire, plastic ties and/or duct tape are real smart items to carry when snowshoeing 'cause once you break a shoe you either fix it or struggle to get home. I should add; I Really prefer snowshoes with toe cups on hilly terrain. They truly prevent much shifting of the foot and the then necessary adjusting of the foot straps/harness. Thanks for the link! That is valuable to know about a claw that will fit on any snowshoe. Re claws for icy conditions, I have my modern 9x30's, but too often I find myself moving from ice or crusty snow to deep soft snow conditions within a few steps, getting out of the mess of a plowed logging road in a canyon or changing back and forth from south slope to north slope on small steep ravines. North face shaded ravines are the pits, literally, as you know. They often are filled with much deeper and softer snow than what got me to that point. I am seeking the impossible I know, one snowshoe to fit all these conditions on one short trek, so will put up with larger than needed part of the steps. Since I am often hiking a short distance from a logging road into forest, I spend a ridiculous percentage of my snowshoe time in the horrible transition zone of down trees along the edge of nearly every forest cut line. Very different application than trekking distance in unbroken forest, which I really enjoy but don't do very often. One day that I did some distance in quite open country, I stayed on top of windswept ridges as much as possible in a series of parallel ravines. I could take off the snowshoes and backpack them on the ridges, put them on and flounder in snow four feet deep on the lee when I had to cross a ravine, and snowshoe easily on top of firmed up snow on the windward and sunnier side of the slopes. Just writing about it makes me wish I was out there now! I have tried and own many different styles of traditional snowshoes and live in an area with extremely dry snow so you sink easily. In my experience the best design for staying afloat is the Alaskan model. 60 x 12 is what I use. After that the Ojibway, also 60 x 12. These snowshoes work better than xc skis for floatation and stability. FWIW update. I bought a pair of GV Wide Trail snowshoes in 12x42. Have only seriously used them once and I like them. I had no trouble with the width, nor with length. Wish they were longer, but think that they are the best compromise for my use. Really appreciated the knowledge folks on this site shared with me. Your hard won experience saved me much of the hard part.